Every now and again I have the pleasure of taking a new (often simply new to me) piece of hardware for a test drive. Over the last few weeks I have been trialing the Plantronics SAVI W420-M. From what I can tell the M likely stands for Microsoft as this is the W420 that’s optimized for Microsoft Lync. 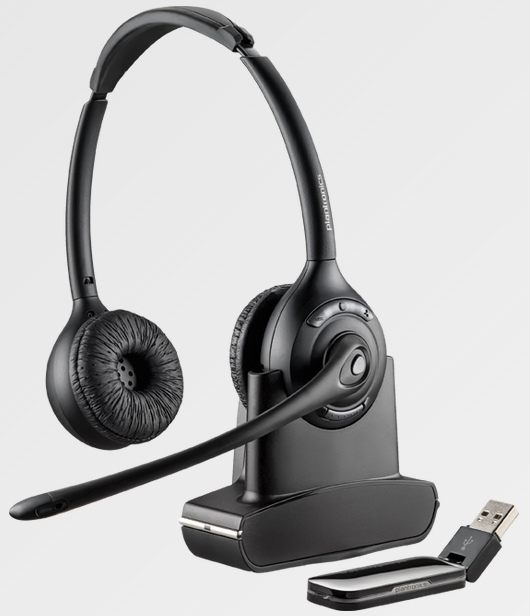 This headset is fully adjustable, the speakers swivel both inward and outward for the perfect fit. I seem to have developed a sensitivity for the more intrusive in-ear designs and tend to stay away from wearing that sort of design for extended periods of time. I also like the way it fits into a decent carry case, just throw in the USB dongle and you are off. I have always preferred overhead styles compared to overear. Of course being overhead, wireless and stereo it had my attention from the get go. Once I had worn it for a few consecutive days, listening to music in-between calls I noticed how light and comfortable it really is. Try wearing any headset for a few full 8 hour plus days and you will quickly separate the men from the boys. I also like how I can just drop it to around my neck when having to step away for a minute without feeling conscious about wearing a headset. It actually feels rather funky to wear. My 18 month old son wore it for a full Skype discussion with Gramps via skype. I was really surprised as he really dislikes having things on his head. It fit him very well too, once I had made a small adjustment. I had to bribe him with a treat to get my headset back..
Perhaps a portable charger or charge over USB option can be added to this excellent headset. Carrying around the charging kit is the only negative IMHO. Overall I give it a 9/10. I have to add that this is very fast becoming my most used headset, second only to my Voyager Legend.